This microvelvet dog bed gives pooped dogs a heavenly place to lay their heads! Your dog will love the security of the outer ring, while the removable bottom conveniently doubles as a travel mat or crate pad. Liberally stuffed with ‘high memory’ polyester fiberfill. To machine-wash, simply unzip the outer cover. 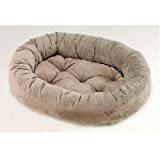 The bottom cushion may be washed as is, since special tufting prevents fibers from shifting or clumping. This entry was posted in Dogs and tagged 16in, 21in, Bowsers, Donut, Granite, Microvelvet, XSmall by One Boutique. Bookmark the permalink.